Home > How you can contribute to protect Dharma ? How you can contribute to protect Dharma ? Hindu Dharma, revered by the entire world and protected by Divine Incarnations, Sages and Saints, kings etc. from time immemorial, is today under threat from every direction. Attack on Hindu Dharma by traitors to Dharma and anti-Hindus alike, has become the order of the day. 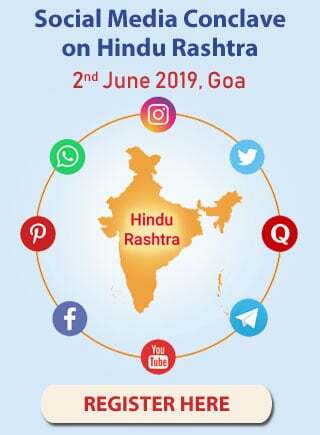 Sanatan Sanstha and Hindu Janajagruti Samiti are putting up a fight within the legal framework, for the cause of protecting the Nation and Dharma. You too can participate in their mission ! Do this to protect Dharma ! 1. Prevent denigration of Deities and patriots that takes place through pictures, advertisements, plays, get-togethers, newspapers, different products etc. ! Refuse to buy products that denigrate Deities and patriots ! 2. To prevent Idol-breaking and thefts taking place in temples, educate trustees of temples and associated villagers ! 3. To prevent the killings of Hindu leaders and Saints, take self-defence training and thereby develop the ability to defend yourself ! 4. Launch agitations against the unjust arrests of Hindu Saints and their subsequent harassment in the prison ! 5. 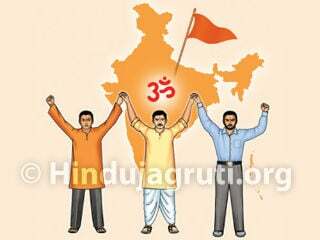 Educate Hindus on the anti-Hindu conspiracies such as attacks on religious processions of Hindu, cow-slaughter and ‘Love Jihad’ ! 6. Legally oppose anti-Dharmik acts such as making of laws like ‘Anti-blind faith Bill’, ‘Temple takeover Bill’, so also the Government policies such as declaring temples as illegal and demolishing them ! 7. Oppose religious conversion of Hindus that is taking place either by luring them or by force ! 8. Lodge complaints with the Police against those who criticise Hindu Dharma, Deities, Holy texts, Saints and patriots under IPC section 295(A) and/or 153(A) ! 9. Prevent malpractices such as forcible collection of funds, vulgar dancing, eve-teasing, gambling and consumption of alcohol in religious festivals and fairs ! A. Education : Educate the individual who is causing harm to Dharma and prevent him/her from causing further harm ! B. Protest : If the act of causing harm to Dharma continues even after attempts to educate, lodge protests in various ways; for example, write letters, send protest messages by fax’or E-mail; contact directly over thephone ! C. Memorandums : Submit memorandums to Government requesting it to stop harm to Dharma ! E. Police complaints : Register complaints with the local Police against the individual/firm for having hurt your religious sentiments ! F. Lawful agitations : If the harm to Dharma continues despite the aforementioned measures, protest in a lawful manner ! If we protect Dharma through such measures with a sense of duty, we will become eligible for God’s grace.